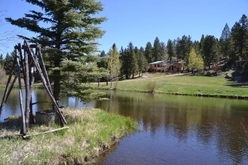 Box V Cabin – Tucked into a beautiful valley with end of the road privacy and bordered on two sides by Pikes National Forest, this quaint cabin overlooks a picturesque meadow and tranquil stream-fed pond. Delight in the antics of a variety of wildlife that wonder onto the property to enjoy its meadows and cool, clear waters. Its 15+ acres offer a park-like setting with mature aspen and pine, rock outcroppings, large boulders and numerous trails to explore. 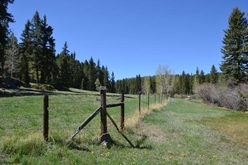 Imagine unlimited recreation (hunting, hiking, riding) just steps from your back door into the adjoining National Forest Lands. Inside the cabin find several private enclaves for ample “personal” space while family and friends enjoy the kitchen, dining, great-room as an all-inclusive gathering area. Warm tones, log accents, vaulted / beamed, tongue and groove ceilings, a wood burning fireplace, hardwood / tile floors, and windows frame the Colorado mountain setting. Box V Cabin will remind you how lucky you are to be away from the ever-present lights and noise of the city. Dusk and dawn can be enjoyed from two decks that overlook the pond. A detached 3-car garage and other outbuildings provide ample space for big-boy toys, hunting supplies, hobbies, or the needed workshop space for any number of projects. A domestic well allows water for horses, chickens, goats or other domestic animals. The property is gated, partially fenced and has no covenants or HOA. With 300+ days of sunshine, blue skies and low humidity, it is a perfect fit for the avid outdoor adventurer or even the reflective and meditative type who appreciate “lazy days” amid the natural beauty and peacefulness of a magnificent mountain setting. 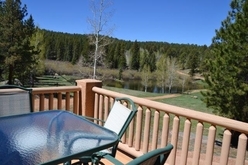 Only 20 minutes from Woodland Park, Colorado – a friendly mountain community with an abundance of nearby attractions and activities for every age. Box V Cabin is your “escape plan” for fun times, relaxation, great hunting or everyday living!